The new Mormon Tabernacle Choir album topped the Billboard Classical Crossover chart for the 12th time. The Mormon Tabernacle Choir’s latest album, Mormon Tabernacle Choir and Friends, has taken the number one spot on Billboard’s Classical Crossover chart (as well as the second spot on the overall Classical chart). This latest achievement makes it the record 12th time that the group nicknamed “America’s Choir” has earned the top spot and honor. This newest album from the choir is the culmination of 15 years of collaboration with the world’s top performers and musicians. 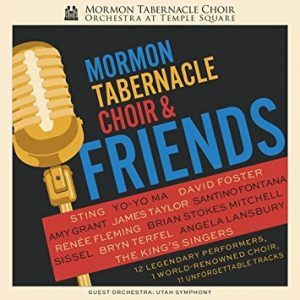 Mormon Tabernacle Choir and Friends consists of some of the top highlights over the years and features tracks with James Taylor, Yo-Yo Ma, Angela Lansbury, Sting, David Foster, and many others. Choir director Mack Wilberg said the reception of the new album has been positive and he loves the memories that have been created through making it. The Mormon Tabernacle Choir is a 360-member choir that has performed around the world. They’ve graced famous concert halls, and have been featured in television and radio performances. They have been a recognizable name and representation of their faith for decades. Their new album, Mormon Tabernacle Choir and Friends, is available on Amazon, Desert Book, and ITunes.